CU CHI - "Would you believe we have to check out our detail truck every day to make sure there are not too many men aboard?" said Captain Edward J. Kellogg from Arnold, Mo. civic action officer for 725th Maintenance Battalion. 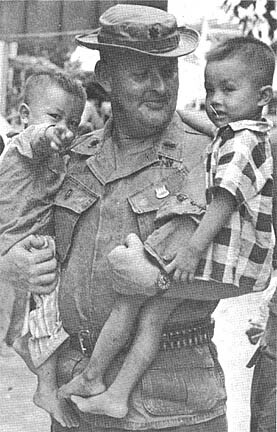 That's the kind of enthusiasm that goes into the battalion's support for the Catholic Rose Orphanage in Hoc Mon, 17 miles southeast of Cu Chi. The detail truck leaves Cu Chi every day with soldiers who strive to better the living conditions of the 125 children who live at the orphanage. The men paint buildings, construct swing sets, jungle gyms, and see-saws for the recreation area, kindle the kitchen's cooking fires with wood from shipping crates they tear apart, and haul fresh edible garbage in from Cu Chi to fatten up the orphanage's sole source of income - the pigs. ONCE A WEEK they also provide a medical civic action program for the orphanage with a little help from their friends at 25th Medical Battalion. 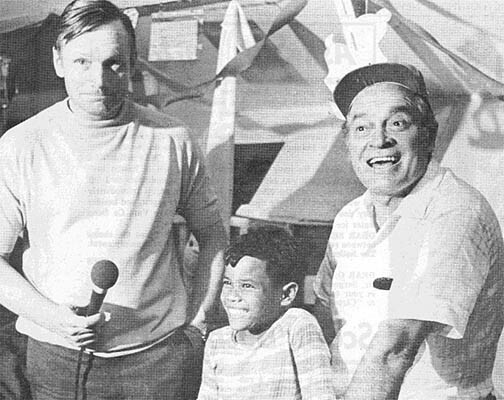 "These regular MEDCAP visits to the orphanage were originally planned to be only for the orphans. But other villagers sneak in the back way to seek medical attention too and we cannot turn them down either," Kellogg stated. The battalion also plans to provide the orphanage with money to buy needed equipment which the nuns cannot afford to buy. Lieutenant Colonel Maxie O. Redick, the battalion commander, has asked his men to donate money to a standing fund for the orphanage every payday. The first collection, which was made in November, netted more than $800. The battalion has already used part of this money to buy a new electric water pump for the home's well. About 60 of the orphans come to stay with 725th troopers each weekend. The unit takes this opportunity to see that the little visitors are well-fed and well-entertained. "We all take turns taking care of the kids when they come to visit," said Specialist 5 David L. Ault, a helicopter repairman from New Philadelphia, Ohio. "It's nice. It's just like home." CU CHI - Two days after springing an ambush that netted Bravo Company of the 2nd Battalion, 12th Infantry two enemy soldiers, the Warriors set out to catch more of the enemy off guard on a two day bushmaster operation that killed three more of the enemy. Operating in the X Sa Nho area south of the Ho Bo Woods, Bravo Company set up three platoon-sized ambushes. At about 1830 hours the first platoon led by First Lieutenant Tom McSee of Atlanta, Ga. engaged a small enemy force. One of the enemy was killed. McSee described the action. "We were checking out the area before setting up for the night when we caught them by surprise. The enemy was sitting around a destroyed hooch cooking a pot of rice big enough for seven or eight people. We opened up on them killing one of them." AN HOUR LATER Bravo Company's second ambush set up in an open area in a dense line of brush. Four of the enemy were caught as they were patrolling the area. First Lieutenant Larry Crawford of Worthington, Pa. said, "We spotted them with our starlight scope. They were moving toward our position. When they were only about 20 meters away we blew our claymore mines and opened up with grenade launchers and small arms." During a sweep of the area after the fight the Warriors found one dead enemy, an AK-47, three AK magazines and blood trails. A SWEEP THROUGH the same area early the next morning turned up another dead enemy hidden in heavy brush. A K-54 pistol was also found. On one of the dead enemy a sum of approximately $150 in piasters was found. He is believed to have been an NVA regimental political officer. CU CHI - Hey, GI! ... Come and get us!" was the enemy's cry to the men of Bravo Company, 2d Battalion, 14th Infantry. The GIs heeded the call and killed six of the talkative foe. Specialist 4 Robert Barrett of Easton, Pa., said, "We were just setting up our secondary defense of claymore mines when we heard them coming down the trail right in front of our lines of claymores." "After the smoke cleared," Specialist 4 Jim Williams of Montgomery, Ala., said, "we could still hear them trying to psyche us out, but we kept our cool and waited for a light fire team to come in and shut them up. CU CHI - An element consisting of eight men from the first platoon of Alpha Company, 1st Battalion, 27th Infantry clashed with an enemy element of 20 enemy near Bao Tri, killing five in an hour-long firefight. "We spotted them running out of some hooches to our front," said Staff Sergeant Cosmo Trentacosta of Taft, Calif. "As soon as we were sure they were V.C. we opened up with a heavy volume of fire," he said. 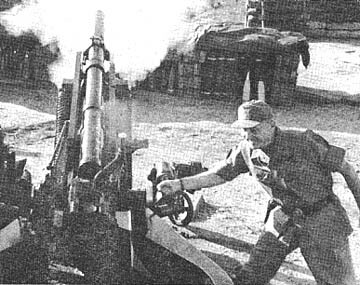 Spreading his men out to cut off any escape routes, Trentacosta positioned himself between the enemy and his element and directed the fire. "While we were in contact Sergeant Trentacosta called in gunships and arty while directing our fire." said Specialist 4 William Steward of Flint, Mich.
After one hour of engagement the Communists pulled back into hedgerows. Wolfhounds swept the area uncovering the bodies of five enemy. Upon investigation it was discovered that the enemy element consisted of five high-ranking officers with a security element of 15. Three enemy officers as well as two security guards were killed. Now that the Vietnamese dry season has begun, the average daily temperatures will start going up. Hot, humid climates take their toll - vital salt content of the blood is lowered due to sweating. Guard yourself against heat exhaustion by taking salt pills and always take plenty of water with you when going out into the field. DEROS. Do it the safe way. 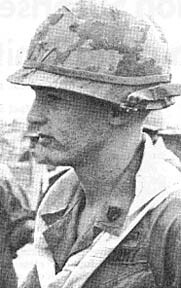 CPT Ralph G. Laubecher, B Co., 1st Bn, 5th Inf. WASHINGTON (AFPS) - Deputy Secretary of Defense David Packard, on his recent return from a 10-day visit to Vietnam, outlined his impressions to newsmen at the Pentagon. Mr. Packard said he "was very impressed about the progress of the Vietnamization program. At every one of the U.S. commands I visited, the Commander had at the top of his priorities, Vietnamization. Second in the list of priorities, pacification, and third, the responsibility to get on with his fighting command, and I think that was a very encouraging thing." Mr. Packard talked about the success of the self-defense program, saying, "The People's Self-Defense Force has been organized with a rather large number that essentially says that all the people in the village and hamlets, outside a certain age group, are given an assignment to do something in support of their village. I was very encouraged at what I saw there." In response to a question, Mr. Packard pointed out that the rate of U.S. withdrawals depends on three factors: the Paris peace talks, the level of enemy activity and the rate of progress in Vietnamization. He found little encouragement in the first two factors but said, "I am convinced that progress in Vietnamization is moving ahead so that we can continue our withdrawals." Asked whether South Vietnamese forces could hold their own against the enemy, Mr. Packard said there had already been a number of tests in which the South Vietnamese had acquitted themselves well. "Of course that Ben Het battle is the one you hear the most about," he said, "but there have been a great many other areas. 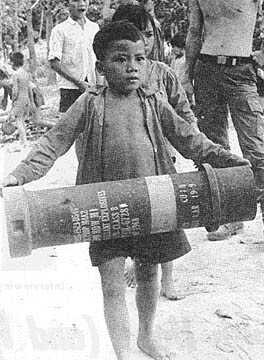 "For instance, the 1st ARVN Division has undertaken a number of specific actions. They have had a killed-in-action ratio of 20 to one in their engagements with the enemy. So, there has been quite ample evidence that they can handle the job extremely well." 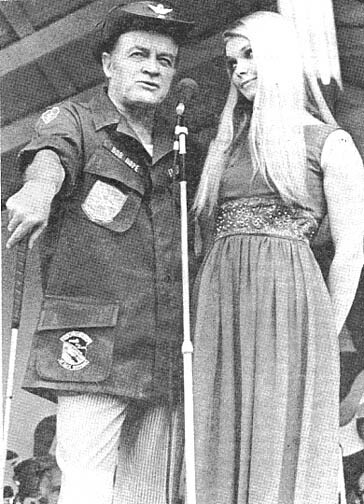 The Red Cross distributed more than 27,000 "ditty" bags stuffed with practical items to 25th Division troopers during the 1969 holidays and handed out more than 500,000 bags throughout Vietnam. The gift bags were a result of "Operation Shop Early",' a program which Red Cross chapters spearheaded in some 1,500 communities last summer to make sure that all American military personnel in Vietnam received a Christmas gift. Local and national businesses, clubs, schools, churches, and individuals were involved in making and filling the bags. In addition to the bags, thousands of parcels of individually wrapped gifts, books, cards, letters, and food addressed to "servicemen in Vietnam" were distributed by the Red Cross. RED CROSS "ditty" bags were distributed by members of the 35-voice division choir as it toured outposts during the holidays. An Army nurse tosses a gift package to troopers atop a bunker. SCHOFIELD BARRACKS - The 4th Brigade, 25th Infantry Division, under the command of Colonel Charles E. Spragins, was activated Dec. 16 in ceremonies at Lightning Field. The brigade, which replaced the demobilized 29th Infantry Brigade, becomes part of the Pacific Reserve Force and returns to Hawaii, in name, the close ties between Hawaii's own 25th Infantry Division, now fighting in the Republic of Vietnam northwest of Saigon, and the people of Hawaii. AFTER A 17-GUN salute was fired and the brigade's activation orders were read, Major General Ben Sternberg, commanding general of U.S. Army, Hawaii, presented Col. Spragins with the brigade color and the command of the new unit. The historical association of the 25th Infantry Division and the State of Hawaii dates back to Oct. 1, 1941, when the 25th was one of two divisions formed from the old Hawaiian Division. FOUR OF THE brigade's organic battalions retain the same regimental designations as units of the 25th Division in Vietnam: 2d Battalion, 5th Infantry; 3d Battalion, 14th Infantry; 3d Battalion, 27th Infantry; and 5th Battalion, 13th Artillery. Other units of the new brigade are Troop H, 10th Cavalry; the 161st Aviation Company; the 76th Engineer Company; the 425th Support Battalion; and the 50th Military Intelligence Detachment. 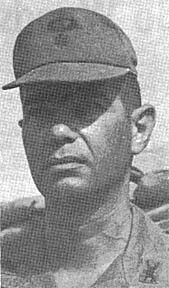 TAKING COMMAND of the 2d Bn., 34th Armor at Fire Support Base Buell was Lieutenant Colonel William M. Greenburg, former 1st Brigade executive officer. Lieutenant Colonel Tommie G. Smith, the departing commander, has been reassigned to the 2d Field Force. A Veterans Administration representative will visit 25th Infantry Division units to answer questions regarding benefits on Tuesday, Wednesday and Thursday this week. He will be at Division Support Command Headquarters at 2 p.m. Tuesday. Wednesday he will visit Division Artillery Headquarters at 10:30 a.m.; 2nd Brigade Headquarters at 1 p.m. and 3d Brigade Headquarters at 3 p.m.
Thursday he will be at the 1st Brigade movie theater at Tay Ninh at 1 p.m.
Staff Sergeant Douglas Conn, while serving as platoon sergeant for the scout platoon of Headquarters and Headquarters Company, 4th Battalion, (Mechanized), 23d Infantry displayed heroic actions when his platoon came into contact with a platoon of enemy soldiers while on night patrol in November. When a reactionary force arrived at the battle area, Conn discovered that one of his men was missing. Unhesitatingly, Conn organized his men and led them through perilous area in search of the missing soldier. When the unit came under intense enemy fire, Conn jumped from his armored personnel carrier and ran through the barrage of fire. After locating the missing man, Conn was informed that because of the weight of his pack the soldier was forced to leave it behind. Knowing that the pack contained a rifle scope, which could be of possible value to the enemy, Conn began to assault the hostile positions. He braved a dangerous hail of fire as he threw numerous hand grenades on the aggressors, which forced the enemy force to withdraw. After securing the pack, Conn returned to his vehicle and continued firing upon the fleeing enemy soldiers. TAY NINH - About 1,200 Vietnamese children turned out during the holidays for two days of crafts, games and cleanup activities in Tay Ninh City. Sponsored jointly by James Teague, New Life Division of CORDS and his Vietnamese counterpart, Van Nguyen Hoang, and supported by members of the 1st Cavalry Division and the 25th Division's 1st Brigade S-5 sections, who supplied trucks, rope, water, food, a generator and about 33,000 piasters to the project, the entire Youth Activities Festival was termed a huge, smashing success. MEMBERS OF Boy Scout, Girl Scout, high school and various church groups turned out by the hundreds to erect tents, build campfires and camping areas; and demonstrate their decorative skills with rope, colored paper and costumes. Sturdy bamboo towers 20 feet high with rope-bamboo ladders were constructed using only rope and standard Boy Scout knots to keep them together. ABOUT SIX truckloads of trash were hauled out of the Cao Dai marketplace to the city dump and burned. A fast-paced series of volleyball games highlighted the first afternoon's activities after all construction, inducing volleyball poles and net, was completed. 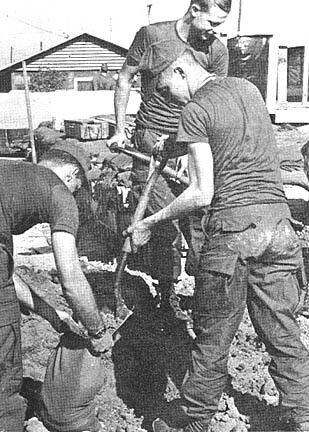 CU CHI - "If it doesn't grow, pick it up" is a directive bellowed into the ear of every trainee every day of basic training. Specialist 4 John Mack of Windsor Locks, Conn., a rifleman with Alfa Company, 1st Battalion (Mechanized), 5th Infantry proved he learned this lesson well. The Bobcats were on a sweep north of Fire Support Base Devin where Mack's track forged a water-filled crater. Something that doesn't ordinarily grow in any water filled crater caught his eye, a plastic bag. Mack halted the APC and policed up the bag. It contained 5 RPG-7 rounds. 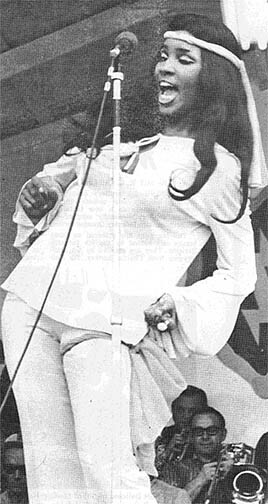 All the items were carefully wrapped in plastic or in NVA ponchos. The day following the find Brigadier General D. S. Henderson, assistant division commander, visited Devin to present Mack with a Bronze Star with "V" device. DUC HOA - Soldiers caught in the kill zone of an ambush are lucky to live to tell the tale, and that's how men of the 1st Battalion, 27th Infantry Reconnaissance platoon feel after a recent patrol south of Duc Hoa. Eleven men of the recon platoon were moving along a narrow trail near highway TL10. It was a combined ambush patrol, with eight Vietnamese PRU's (Provisional Reconnaissance Unit members) along. As the patrol neared the main road, the sharp crack of AK47s split the air, and everyone hit the ground. "THEY WERE VERY CLOSE, the nearest about twenty feet; there were muzzle flashes all around us" said Sergeant Ronald Kreinbrink of Quincy, Mich., leader of the patrol. "We fired back at the muzzle flashes and crawled for cover, although there was concertina wire on the sides of the path which meant we were pretty well stuck in the open," he said. After the initial AK47 fire, RPGs began to rain in from an estimated platoon of enemy soldiers. 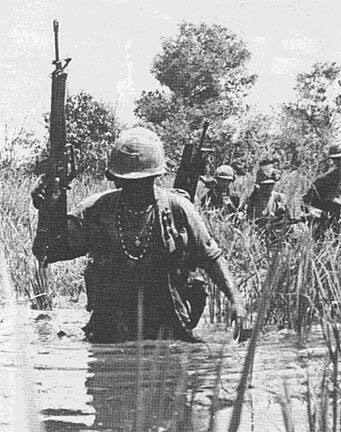 THE MEN RESPONDED with their M60 machine guns, M16's and M79 grenade launchers. One grenadier, Specialist 4 Greg Hall of Spokane, Wash., described the action. "I wasn't really scared until the RPG's began coming in - then I wasn't sure whether or not they had us zeroed in." "I couldn't fire directly at the enemy, since the concertina wire along the edge of the path was right in front of me, and I was afraid my rounds would ricochet and explode near me. I thought I saw movement near a shed, so I sent a round in that direction" he said. THE RECON PATROL and PRU's put out such a volume of fire that the enemy was forced to retreat. A search of the area afterward produced four enemy bodies, along with three new AK47's with magazines. The dead enemy soldiers were NVA, and one was found near the shed where Hall had fired his M79. The round had bounced off the shed and exploded above the enemy soldier who had been lying prone. Sergeant Kreinbrink said later: "The NVA had set up a U-shaped ambush, we realized afterward. I think they were waiting to ambush our reaction force, which was coming from Duc Hoa in jeeps to help. Fortunately we were able to scatter the NVA before the jeeps got there." TAY NINH - An artillery battery is literally barging into remote enemy stongholds thanks to a new tactic - "barge artillery" - recently adopted by 1st Brigade, 25th Infantry Division forces. The big guns are mounted on three barges left behind by the 9th Infantry Division. They are manned by the artillerymen from Charlie Battery, 7th Battalion, 11th Artillery, and infantrymen from Bravo Company, 3d Battalion, 22d Infantry. They deliver instant fire support to areas that were formerly reached by perilous overland trips. The howitzers are mounted two per barge. Ammunition and fuses are kept in storage areas next to the guns. Navy riverine tango boats propel the barges and river patrol boats packed with the infantrymen provide security during passage on the Vam Co Dong river. The guns can be fired enroute with barrels lowered to point blank level. With a retinue of .50 caliber machineguns, 20mm cannons, M60 machineguns and automatic 40mm grenade launchers the flotilla is virtually a fire support base. After arriving at a firing location the barges are secured to the shore and the guns are laid. The infantrymen fan out and dig in on the river banks to provide all around security as the "On Time, On Target" redlegs fire in support of ground operations. Commanders describe the innovation as a combined Navy-artillery-infantry tactic that adds a new dimension to containing the enemy in his own environment. 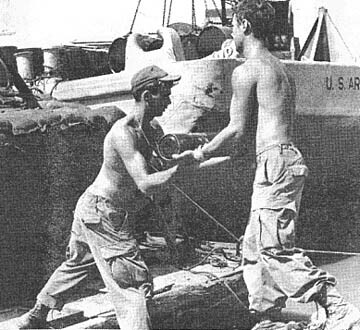 SP4 STEPHEN Delicato (right) of Sterling Heights, Mich., hands PFC James Brennan of Philadelphia, a 105mm round while loading ammunition on one of the artillery barges at Ben Keo. The barges carry guns on the Vam Co Dong river. (Photos By SP4 Dan Neff) WHILE THE M102 howitzer breathes smoke from its tube, the loader chambers another round to prep a landing zone for the 4th Battalion, 9th Infantry Manchus in the Straight Edge Woods. 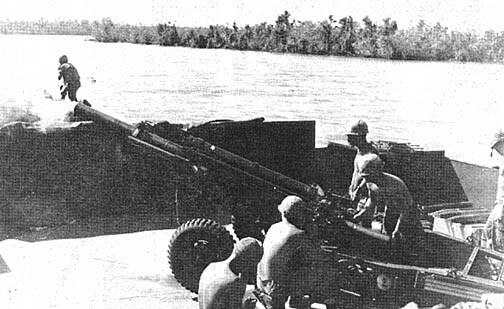 The gun belongs to the 7th Battalion, 11th Artillery which is working aboard the 25th Infantry Division's flotilla on the Vam Co Dong river. TRUNG LAP - The surplus of war was transformed into a cornerstone of education recently when the Civic Action Team of the 2nd Battalion, 14th Infantry Golden Dragons using a little ingenuity and lot of hard work helped rebuild a school in Trung Lap. The original structure was nothing more than a leaky roof supported by a few rough hewn logs. Inside there was no lighting and a few wobbly benches for the students. "WE WERE ON a Medcap operation one afternoon," said Captain Peter Levy of Santa Maria, Calif., "and we stopped to look over the place and right then and there we decided that the children here had to have a better school house." Most of the materials used for the reconstruction job had to be scrounged. Some of the material used came from discarded 155 mm Howitzer cannisters and wood came from shipping platforms. The artillery cannisters were used as supports for new benches and writing tables. The shipping platforms were torn down to provide planks and beams. "THE ONE THING we had no trouble with was the labor problem," said Sergeant Tony Newcome. "The littlest kid to the oldest papasan pitched in to give a hand." With the help of the villagers and the assistance of the five members of the Army team the village's new school building was completed in three days. The only disruption in the building activity came when local Viet Cong took offense to the enthusiasm the people were showing in the project and set up a number of booby trapped 82mm mortar rounds. Luckily all the traps were found before any of the people were harmed by them. "OTHER THAN THAT single incident," Newcome said, "The only other problem was a small one, too many chiefs. Every 'Papasan' had some advice and helpful tips on how to go about building this place. It's a pretty good idea to go along with them, because they are all like your grandfather, they've been doing carpentry a lot longer than any of us." Levy made a final comment on the successful project, "I seriously believe that this work has set the whole civic action timetable ahead about six months." Tomahawk scouts from the 4th Battalion (Mechanized), 23d Infantry, struck again in a rubber plantation just south of Fire Support Base Rawlins and successfully completed another ambush. The scouts' success with ambushes in the same area has been frequent, as they continue to dominate their area of operation. Sergeant Cleman Quade of Jackson, Mo., who led the patrol, said, "Soon after our tracks dropped us off for the night, we spotted movement. They were moving our way, so we quickly got into position and set the trap." A small enemy element moved into the kill zone of the ambush and the scouts opened up with their organic weapons. When the smoke had cleared, one body was found with an AK-47. "It was really dark out in those rubber trees," replied Private First Class Joseph Ewing of Decatur, Ill. "So we set up again near the body, hoping other enemy would come back for it. The scouts hadn't sustained a casualty and now the long wait began to see if the enemy would return for the body. No enemy appeared after the action and a sweep the following morning revealed two more enemy dead about 50 meters from the ambush site. Two AK-47's, field gear, and food that the enemy had been carrying were found. CU CHI - The enemy is getting fed, thanks to a new psychological operations program now underway in Tropic Lightning's 3d Brigade. Brigade psychological operations personnel are air dropping packets of about one kilo, one day's ration, of rice on suspected enemy infiltration routes and staging areas. It's not the rice, but what's in it, that's important to the 3d Brigade's pacification program. "Each rice packet contains chieu hoi leaflets and a safe conduct pass. We're hoping this induces enemy soldiers to give themselves up under the auspices of the Vietnamese government's open arms program," said Captain Frank E. Smith, Arlington, Tex., the brigade's civil affairs officer. Each rice drop is targeted. "We drop the rice in the same area in which it was captured. We know the enemy is short of food in these areas, and he's more likely to pick up the rice we drop," Smith said. All rice used in the program is captured from enemy food caches. "This project isn't costing anybody anything, and it's of great value to the chieu hoi program," Smith said. "We hope to see an increase in hoi chanhs because of it." DUC HOA - A month ago the reconnaissance platoon of the 1st Battalion, 27th Infantry Wolfhounds consisted of 32 Americans and one ARVN interpreter. Now it has 24 ARVN soldiers and 17 Americans. In each of the platoon's four scout teams there are four G.I.s and seven ARVNs who work together on daytime missions and team ambushes. The ARVNs are learning new methods of combat operations. Besides the new methods the ARVN soldiers are trained in the maintenance of jeeps, three-quarter-ton trucks and two-and-a-half-ton trucks which are used extensively by the platoon. DEAR CERTAIN: There is a dangerous new conspiracy afloat in the division's area that I hope you will tell your readers about. Intelligence reports indicate that hoardes of little men, grinning widely and pedalling bicycles with ringing bells, are travelling throughout the division AO yelling "Here come good humorsan. Forty-nine flavors. Nuoc mam ripple this week's special." This conspiracy is endangering morale. Will you pass on the alert? DEAR MAJ: We have indeed heard of this hail of hostile bell-ringing. I myself was accosted by one of the conspirators as I left Cu Chi base camp the other day. Needless to say, I immediately did what I should. These men are detrimental to esprit, and besides they don't have nuoc mam ripple. They only have Vam Co Dong water ice and water buffalo revel. DEAR SERGEANT CERTAIN: The other night I had the choice between reading your column and an Agatha Christie mystery novel. The butler did it. DEAR 0: I'm pleased to be in such good company. By the way, sir, Sergeant Certain has recently finished a book which should be in your conex-libraries soon. It's entitled "How I Won the War," or "Certain Victory." CU CHI - "Our primary concern here is to relieve the anxieties of soldiers newly assigned to a hostile territory, prepare them for processing into the division, and see that they are assigned to their respective units as quickly as possible," stated Captain Albert F. Harvard, commander of the 25th Replacement Detachment, 25th Infantry Division. The first day a replacement arrives in the division, the detachment's cadre explain the division's policies to him and prepare him for in-processing. He is also welcomed to the 25th Infantry Division by its commanding general, Major General Harris W. Hollis, or one of his senior representatives. "I DO NOT CARE if only one replacement comes in, all this is still done for him on the first day that he arrives," Harvard said. "It is our policy to see that no one who comes through here is held up from getting to his destination." On a replacement's second day in the detachment, he receives a briefing on all the services available to him which will facilitate his stay with the division. "If a replacement has not received orders assigning him to a unit within two days, I personally make sure that there is a good reason for the delay," stated Harvard. THE REPLACEMENT detachment also provides billeting for persons who are returning home, dust-off patients who are returning to their units after receiving medical attention at Cu Chi's 12th Evacuation Hospital, and persons returning to up-country units after R&R. 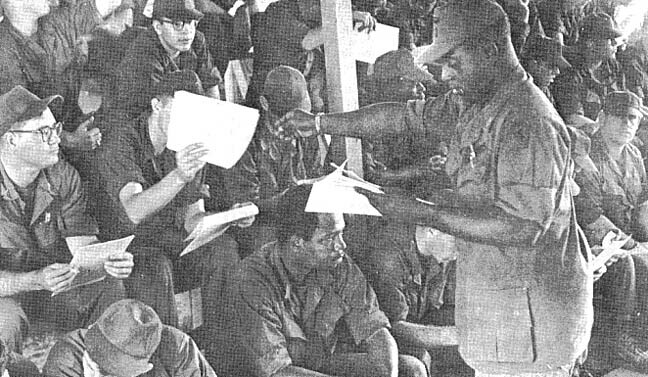 Replacements that are assigned to units at Cu Chi report to their units the same day they get their orders. Those who are assigned to units outside Cu Chi are first sent to in-country training, whereupon the replacement detachment issues them their permanent M-16 rifles. OVER THE PAST YEAR the replacement detachment has come to be nicknamed "Harvard's Hotel" - not without cause. Since December, 1968, the detachment has doubled its billeting capacity and eliminated all use of cots. The May addition of a security room in which replacements and transients can store their valuables has negated major thefts in the area. The mess hall was also completely remodeled, and it received such an excellent rating on its last inspection that Major General Hollis, commanding general of the 25th Inf. Div., decided to visit the mess hall himself. "We try to make the replacement detachment's facilities as clean and comfortable as we possibly can," remarked Harvard. "I believe the people that we serve appreciate it." TAY NINH - An enemy suspect detained by Alfa Company, 4th Battalion (Mechanized), 23d Infantry recently led Tropic Lightning soldiers to a company size enemy base camp. Three suspects were detained late one afternoon by Alfa Company, while operating deep in the Crescent area, eight miles east of Tay Ninh City. At day-break the next morning Alfa Company headed back to the Crescent, aided by the detainee to search for a suspected enemy base camp. "After checking out a number of fruitless leads we were beginning to wonder if the suspect knew where he was going, but we were going to give him one more chance," said Captain Robert Zonne, of Burlington, Ontario, Canada. As often happens, the one last chance paid off. While crossing one of the open fields, approaching a dense woodline, the detainee stopped suddenly, and pointed directly into the woodline, simultaneously dropping to his knees, as did the Tomahawks. After several minutes of reconning by fire into the woodline, the Tomahawks found a company-sized enemy base camp less than 30 minutes vacated, the rice still boiling in the pots. The suspect pointed out the bunker he had occupied the previous night, and told the Tomahawk Infantrymen to look out for empty ammunition cans, because they were probably boobytrapped. After carefully examining each of the 15 bunkers and finding miscellaneous ammunition, food, and clothing, the Tomahawks destroyed the bunkers and proceeded into the jungle, hot on the heels of the enemy. CU CHI - Nobody likes a tax collector but imagine the plight of the South Vietnamese peasant-farmer who pays taxes twice over. One payment of course goes to the Republic of Vietnam - the other to the shadowy Viet Cong Infrastructure. Being a VC tax collector can be a very profitable occupation, according to 3d Brigade acting S-5 officer Captain Frank Smith of Arlington, Tex. "The VC tax collector gets a percentage of everything he takes in. Since he sets the tax rate too, the more he taxes, the more he makes." The average peasant-farmer is hit for about 500 piasters annually or its equivalent in rice, according to Smith. This doesn't seem much by American standards but when one considers the average Vietnamese farmer makes only about 10,000 piasters a year, it takes on more significance. In return for the tax money, the farmer receives absolutely nothing - not even a receipt. If his tax collector is captured or leaves the area, he has no way of proving to the new collector that he has already paid for the year. And there is no special court of appeals. Smith points out that for those who do refuse to pay, there are public denunciations, beatings and even murder - examples for others who might follow suit. "About 90 percent of the people in Hau Ngia Province still pay these taxes - mostly out of fear," pointed out Smith. "What we're trying to do is get the people to point out the district collectors. Last week the people tipped us off about a husband and wife tax team working Rung Dau village. Working with the 3/4 Cav's mini-cav and the National Police, we caught the wife with more than 5,000 piasters in small bills stuffed in a sand bag. It's a start and hopefully, a breakthrough," he concluded. FSB CROOK - A busy night for the defenders of fire support base Crook spelled disaster for a sapper team of NVA in an early morning attack. An estimated 20 of the enemy attempted to pierce the wire and use their satchel charges against the defenders. Their efforts were in vain as the members of Charlie Company, 3d Battalion, 22d Infantry, stifled the attackers before they had a chance to utilize their lethal charges. Listening posts, starlight scopes and radar all came into play in the discovery of the repeated attempts by the enemy to approach the wire in small groups. Organic weapons and artillery spelled doom for the invaders during their attack on this forward base of the Regulars. A sweep of the area in the morning by Charlie Company turned up six dead enemy and one wounded enemy who relinquished valuable information. Two AK-47 assault rifles, more than 40 Chicom grenades, three RPG-7 launchers, satchel charges and small arms ammo also fell into the hands of the Regulars, along with an enemy radio. CU CHI - Nguyen Van Sam (Sam to his friends) has been living for two months with 2d battalion, 27th infantry's Delta Company supply people. "We first noticed Sam one night in our NCO club playing the slot machines," said Sergeant Howie Habas of Brooklyn, N.Y.
"It was an instant friendship," said Staff Sergeant Richard Del Carpini, Warwick, R.I. "Sam came over to our hootch that evening, spent the night and has stayed since," Del Carpini said. The guys in Delta supply had a Christmas party for Sam. "Some of the guys are saving some of the unopened candy, games and gifts that were sent from home to give to Sam," Del Carpini said. Sam was living with Charlie Company, 2 battalion, (mechanized), 22d infantry in Tay Ninh. The company was sent to Cu Chi to work with the 2d Bn, 27th Infantry Wolhounds. Realizing that he could not return to Tay Ninh because the Triple Deuce men had no papers on him, Sam decided to stay with the Hounds. "I first thought that possibly I would adopt Sam," Habas said. "But being single, and sharing an apartment in NewYork City with an 11 year old who is used to an uncomplicated type life, would be too much for Sam," continued Habas. "What I would like to do is first take care of the paper and legal work necessary to allow Sam to stay with us. Then either get him into a school or maybe an orphanage," Habas said. "Right now I am stuck as what to do. I am open to suggestions. Hanging around with us is fun for him now, but it offers no future." 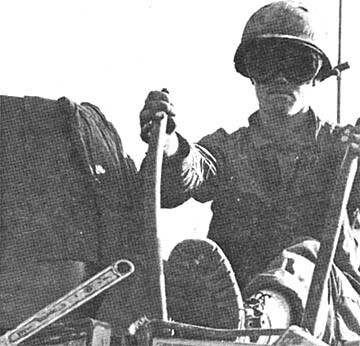 CU CHI - A California golf pro has hit the tour this year as a forward observer for the 2d Battalion, 77th Artillery. 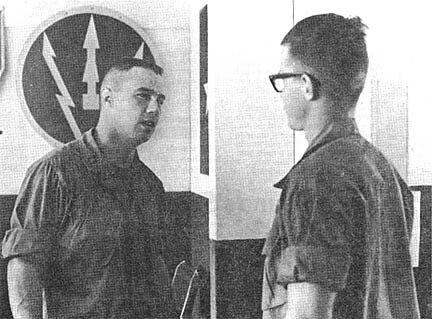 "I think being an FO in Vietnam will compare with the life of a golf pro in civilian life in one respect; in both lines of work you have to put in a lot of hours." That's First Lieutenant Stephen Brown's analysis of his new job. Brown lives in Middletown, R.I. He was assistant pro at El Niguel Country Club in Laguna Niguel, Calif.
Brown's interest in golf developed when he was twelve. As a result of his father's occupation - a Navy Captain who commands Destroyer Division 202 home-ported in Newport, R.I. - Brown has played golf throughout North and South America. "We moved so much when I was younger that I ended up going to several grade schools, and two high schools. But I played on the golf teams at each of the high schools," Brown said. In 1963, Brown placed fourth in the State High School Golf Tournament in Virginia during his junior year. "That was one of my better rounds in those days. I hit 17 greens and shot 78 for the tournament," he said. Today, the Army pro shoots closer to 70. CU CHI - "It was just about over by the time we got there," was how Private First Class Pete Fleischhauer of Bend, Ore., described recent Golden Dragon contact that netted six NVA dead. The battle began when a command and control helicopter spotted an unknown number of enemy in light brush. A Stinger gunship from the 116th Assault Helicopter Company worked over the area before Charlie Company, 2d Battalion, 14th Infantry were lifted into the region. "Those ships really did a job on that brush," said Specialist 4 Bill Noland. "By the time we got there, it was just a matter of counting the dead and taking prisoners."